Pounding nails into a bar of soap while chattering with my dad is such an early sensory memory. The hammer head was small and green. The soap was old and hard, but I could smell it and the sawdust on the workbench. What was Dad building? "A project." Dad would say if I "built a better mousetrap the world would beat a path to my door." I was little. Not so sure the world beating a path was a good thing! Heck, I could barely reach the doorknob standing on tiptoe. Mom insisted I not open the door to strangers. We are devising library rodent wildlife management plans at work. By "we", I don't actually mean me. I like Congress better than rodents, although I wouldn't want to remove either of them from a trap. These widdle library mice are not the characters from picture books. They do not wear ballet slippers, or visit their country cousin. They haven't gnawed through the ropes to free a lion. They don't count or mix colors of paints. The are big dang rodents displaced by the demolition of most of our building. They found the gingerbread house in the storytime room. It's the scary Rat King from The Nutcracker, but with a trail of rodent poop. 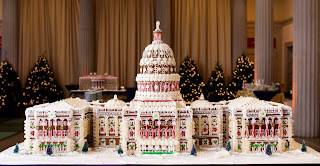 This amazing gingerbread Capitol is from Windows Catering Company. They have a White House, too. A hungry cat works well! I grew up with rodent poop. I didn't grow up with rodent poop, but the neighborhood cats used our sandbox. It was when we lived in Oklahoma that I had to contend with rodent poop in my shoes.